Independent and assisted living communities today provide many options for seniors to be active in the community, socializing in communal areas, and engaging in many events and happenings. But providing a quality, comfortable private resident apartment for their personal time should not be overlooked. Senior communities intend to feel “like home”, and the private residential apartments should follow suit, with considerations specific to seniors taken into account. Has your independent and assisted living community considered the following for your resident apartments? Many times, the resident apartments in assisted living homes have PTACs for heating and cooling. (PTACs are the appliances often found in hotel rooms, underneath the window.) Believe It or not, these can greatly impact the design of a room. PTACs are intrusive and not the most visually appealing, which can affect furniture layouts. During the construction process, designers must be mindful of how the HVAC is going to fit into the room design to be visually appealing and non-intrusive but still provide a comfortable air quality and environment. With today’s seniors expecting more out of senior living communities, and the trend in senior living communities shifting toward providing a more resort-like feel, many new or renovated communities are choosing higher quality finishes in their resident apartments. Keep in mind the level of finishes provided by your competitors, and consider featuring solid surfaces on the countertop rather than plastic laminate as well as cabinetry that holds up well over time and doesn’t show wear and tear. Bathroom storage is always important, and typical residential bathrooms often have a vanity under the sink. This under-sink storage should be avoided in senior living home resident apartments as it may be difficult for seniors to bend down to access these cabinets if they have balance issues, are stiff, or aren’t as ambulatory. Make cabinet storage more easily accessible for your residents by creating pantry-type cabinetry and minimizing vanity storage. Help residents with visual impairments differentiate room from room and floors from walls by utilizing colors strategically. If the color of the floor and wall are similar, it can be a challenge for seniors to recognize the difference and may result in accidental bumps into walls. To avoid this, ensure that there is a noticeable difference between the floor and wall colors, or use a molding of a different color to signify where the wall and floor meet. Different colors for separate rooms can also help signify the change from the living area, the bedroom or the bathroom to avoid confusion. 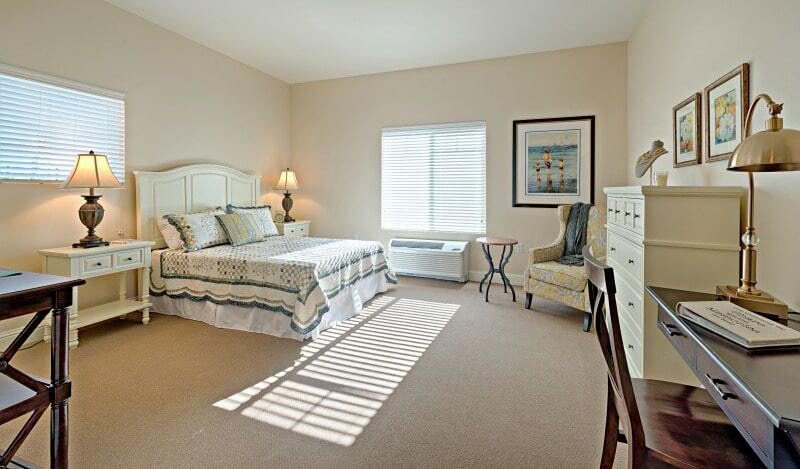 Proper lighting in independent and assisted living resident apartments is important. As you might expect, good lighting is vital to be able to see properly (especially for seniors or those with visual impairments) but lighting also impacts circadian rhythms and sleeping patterns. Since many seniors spend a majority of days indoors, this can have a negative impact on circadian rhythms and sleep health, which can be combated with specific lighting. Understanding window placement and lighting options is important for maximizing the residents’ overall health and quality of life. How are you making your apartments comfortable for your residents? Let us know if we can assist and improving the quality of your senior living resident apartments by contacting us here.